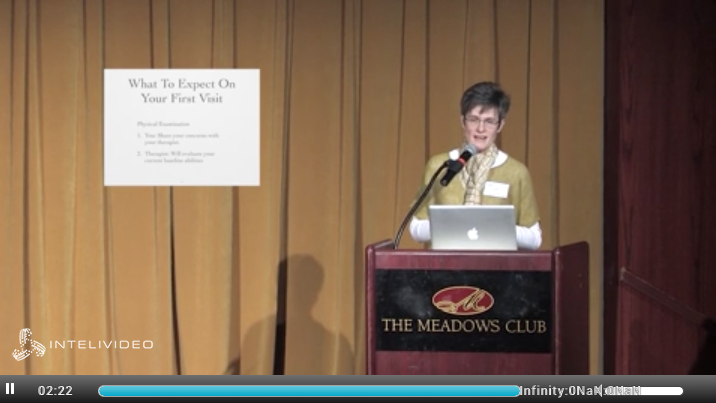 May 31, 2014 | by Darcy Blake | Highly recommended: A video titled, The Role of Physical Therapy in Managing Parkinson’s Disease, Celebrate Your Best Life, by physical therapist Miriam Boelen, presented at the APDA Midwest Chapter Symposium “Live your Best Life” held in April 2014. In 2013, we blogged about Miriam Boelen, known as Mia, who is a physical therapist in the Chicago area specializing in the treatment of people with Parkinson’s disease. Her blog, Physical Therapists for Parkinson’s is unique because it has information you can’t easily find elsewhere. On her site, you’ll find articles that address the basic challenges of PD that aren’t covered frequently, but are major tests in the daily lives of PWP. In her charming, humorous video presentation, she illustrates major movement difficulties and states that the intention of physical therapy is to make the most of your independence so that you have the best quality of life at all stages of Parkinson’s Disease. Her audience indicates with a show of hands that a surprising number of people have never been to a physical therapist for PD. She explores how physical therapy can help PWP with their walking, balance, and transfers, and she offers treatment tips for home use. Her exploration of why you may be having troubles is thought-provoking. Are you having weakness due to inactivity? Do you need to increase your walking speed to be more functional and to maneuver more safely? Are your balance troubles due to freezing or gait, postural reflex problems, behavioral problems such as rushing or impulsive movement, shoe problems, orthostatic hypotension, or misjudging distances? Why are transfers–going from sitting to standing, and getting up from the floor–difficult for PWP? Sequence practice, and an analysis of turning, are included in Boelen’s explanation that therapist’s job is to sort through all of your issues to find out what the source of the problem is. This in-depth discussion is a free, invaluable must-see for anyone with movement issues due to PD. Movement strategies including individualized strength exercise (resistance training), flexibility exercise (stretching), endurance training, and compensatory strategies (using other parts of the brain) can help you feel and move better. Don’t forget Boelen’s mantra, “Big steps, long steps, and heel down first!” It is all up to you! Hey there! Do you use Twitter? I’d like to follow you if that would be ok. I’m absolutely enjoying your’e blog & look forward to new updates. I’d like to say that I use Twitter too. Though I can tweet, I just don’t have time to do it all, so for now my related Twitter is perched on the fence. Glad you like the blog, and I’m delighted that you have taken the time to send a note.